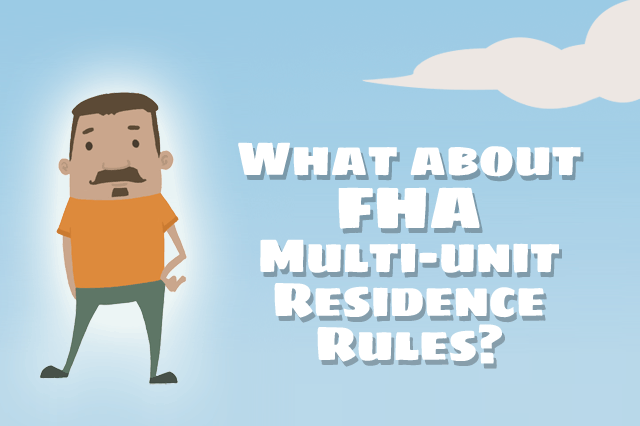 Can I Get an FHA Home Loan for a Multi-Unit Property? FHA loan rules permit owner-occupiers to buy multi-unit properties and rent out the unused living units. Can the borrower convince a participating lender to factor in potential rental income and include it as part of the applicant’s debt-to-income ratio? June 21, 2017 - There’s a wide variety of properties a house hunter can purchase with an FHA mortgage. Condos, manufactured homes, even new construction, which is much simpler these days thanks to the One-Time Close option available from some participating FHA lenders. It’s easy to assume that the kind of home you can buy is a single-unit residence, but FHA home loan rules permit borrowers to buy properties with up to four living units. Such FHA home loans are for owner-occupiers only. HUD 4000.1, the FHA single family home loan handbook, contains a rule stating the borrower must begin using the home purchased with an FHA loan within a specified time after closing (usually within 60 days). FHA borrowers must be owner-occupiers for a minimum of one year. But FHA loan rules also permit owner-occupiers to buy multi-unit properties and rent out the unused living units. This raises an important question about the nature of the rental units-can the borrower convince a participating lender to factor in potential rental income and include it as part of the applicant’s debt-to-income ratio? It all depends on whether or not the applicant has experience as a landlord or a history or receiving rental income. This would be handled on a case-by-case basis and your loan officer will need additional paperwork or documentation to justify considering such potential income. Buying a multi-unit property in some cases is just like purchasing a single unit home with an FHA mortgage. Multi-unit properties must meet FHA minimum standards and pass an FHA appraisal, which should not be considered an FHA stamp of approval or a guarantee that the property is free of defects. That is the job of the optional (but very important) home inspection. Multi-unit properties to be purchased with FHA loans are subject to the usual FHA minimum standards, just as with single-unit residences. Borrowers should expect to pay for the appraisal, negotiate with the seller over the cost of any required corrections or repairs that might be required as a result of the appraisal, and any compliance inspections. Borrowers will find FHA down payment and credit requirements are the same for single-unit and multi-unit properties, but lender standards may vary. Be sure to ask your loan officer how FHA loans for multi-unit properties may differ with a given lender than from single-family units. State law and other requirements may also be a factor, especially for those interested in becoming landlords after the loan has closed.